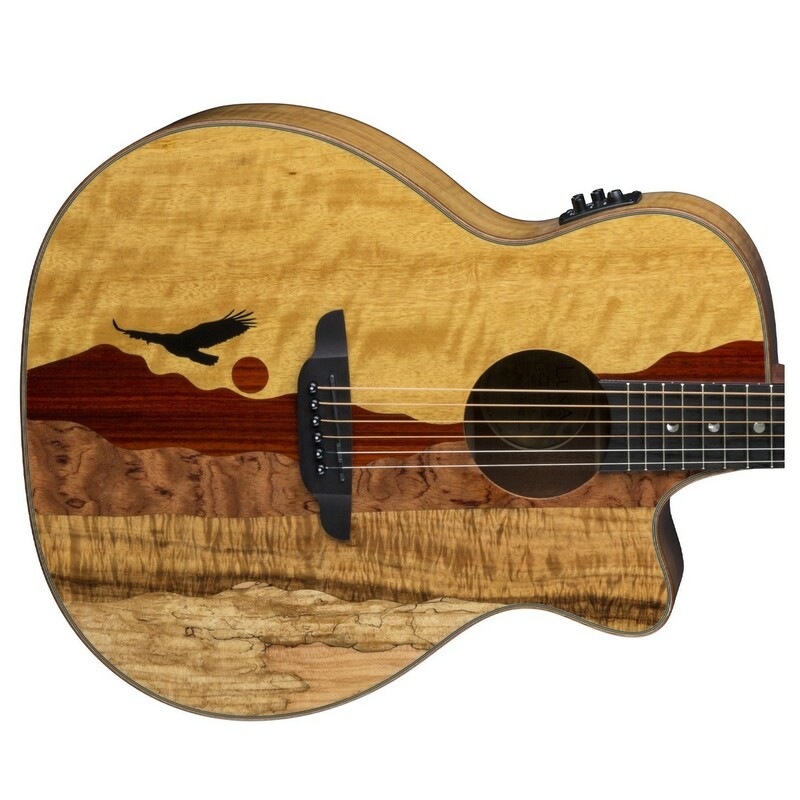 The Luna Vista Eagle Electro Acoustic Guitar offers a truly stunning design that embodies Luna's passion for nature and creative designs perfectly. 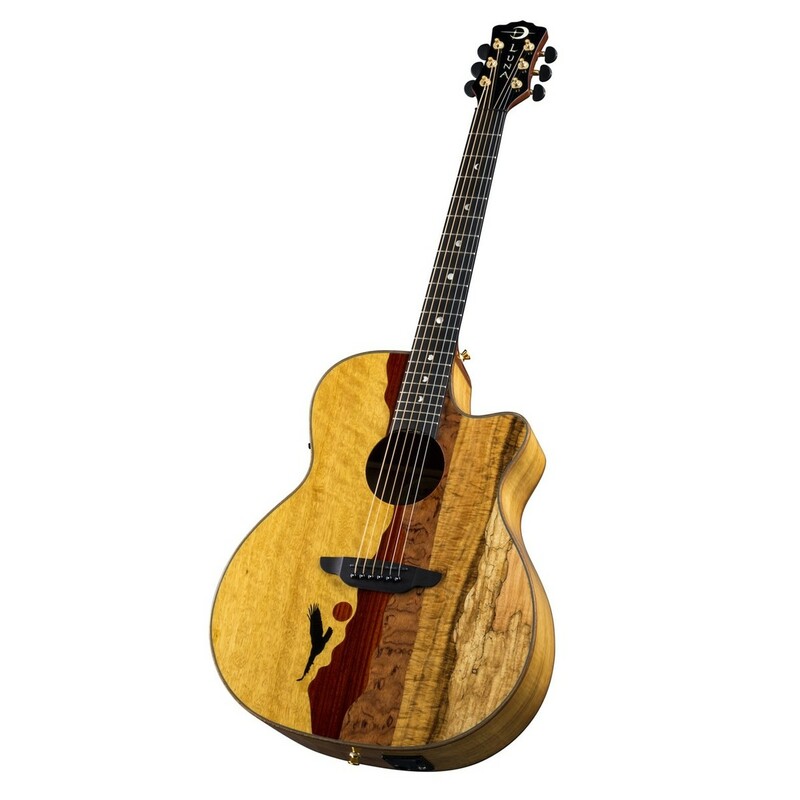 This beautiful electro acoustic features a combination of premium woods on top to create a stunning landscape design, as well as producing a uniquely superb tonal character. With a top crafted from rosewood, zebra wood, paduk, bird's eye maple, koa, and flame maple, the Vista Eagle delivers a rich, bright, and resonant sound that accommodates numerous genres with ease. To provide a comfortable playing experience, the Vista Eagle features a grand concert body that is ideal for those who find the dreadnought size a little too much to handle. In addition, the Vista Eagle is ideal for the gigging guitarist that wants to make a statement. Equipped with B-Band electronics, the Vista Eagle takes off in a whole other sonic direction and offers players basic sound tweaking for live and rehearsal environments. The eagle motif evokes a feeling of majesty and freedom as you play, and its exclusive mother of pearl moon phase inlays, gold and black hardware, and gloss finish provide a truly breathtaking appearance that is sure to stand out from the crowd. With a top crafted from rosewood, zebra wood, paduk, bird's eye maple, koa, and flame maple, the Vista Eagle produces a rich, bright, crisp attack with clear overtone content and a low to mid predominance. Its beautiful mixture of timber also provides a stunning appearance and delivers an overall well-balanced and resonant sound. 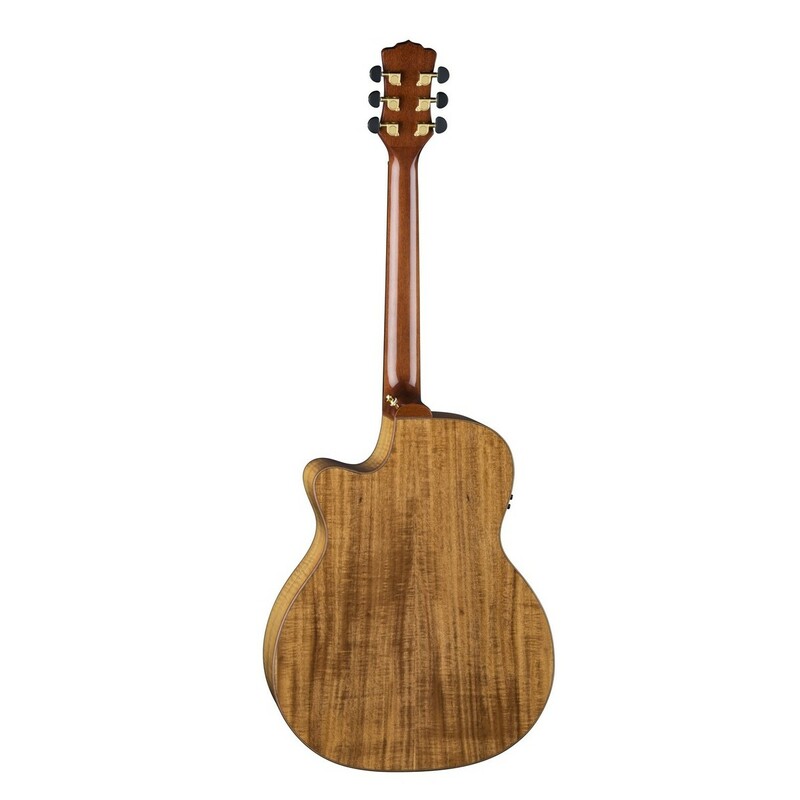 The Vista Eagle's mixed up top is accompanied by koa back and sides which delivers a bright, focused tone that sweetens and warms up the more it's played. 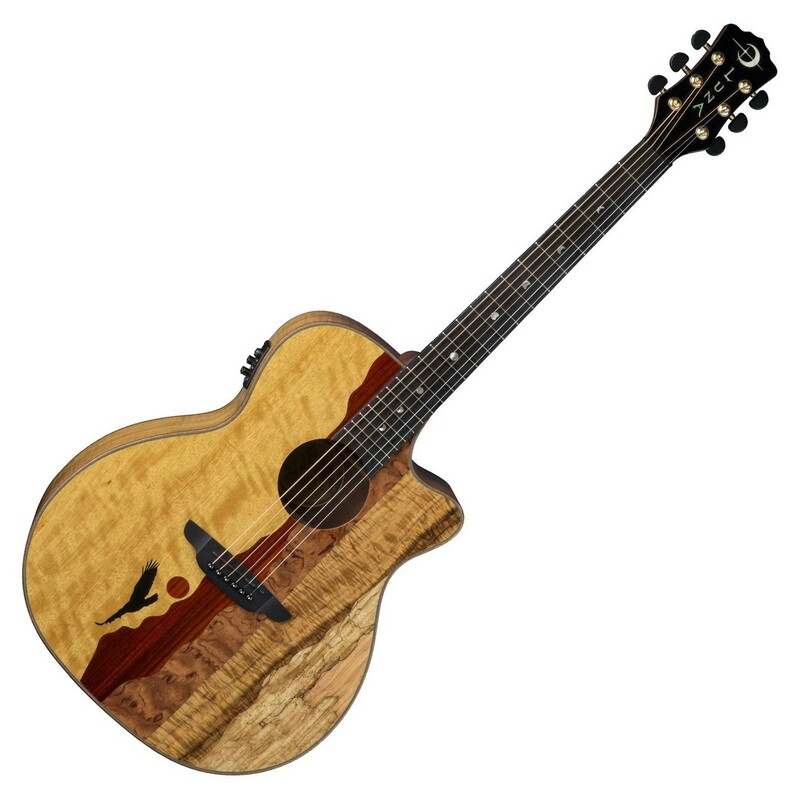 The unique mixture of tonewoods can handle a range of playing styles and techniques with ease, and each individual material offers its own unique tonal character that creates a full, rich sound. Constructed from mahogany, the Vista Eagle's neck offers great durability and superb resonance. Mahogany is commonly used to craft guitar necks, as the wood responds greatly many different styles and techniques. To provide comfort, the Vista Eagle features a C shaped neck profile, which offers players a comfortable and secure grip, reducing the likeliness of a cramping hand. The neck is topped with an ebony fingerboard that provides a bright attack, great sustain, and excellent durability. 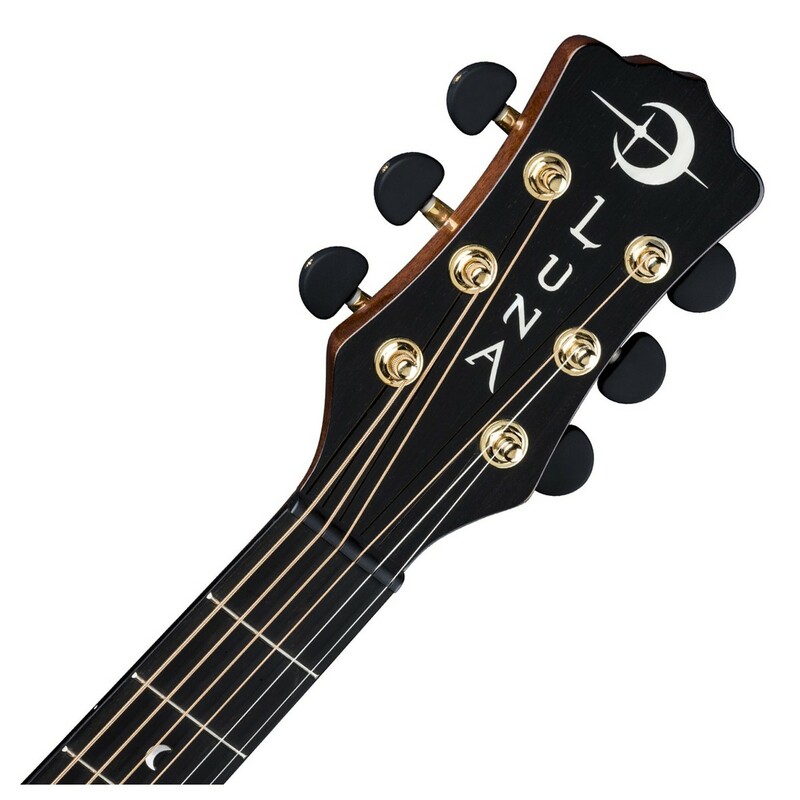 The fingerboard is sprinkled with Luna's exclusive mother of pearl moon phase inlays for added beauty. Equipped with a B-Band T55 preamp, the Vista Eagle's natural acoustic tone can be amplified purely and beautifully with the options for basic sound tweaking. The Vista Eagle will feel right at home in the hands of the gigging guitarist, and its built-in preamp offers players rotary controls for bass, treble, middle, presence, notch, and volume. Its sophisticated system also features a bright, and easy-readable screen for tuning in the darkest of venues. With this, the Vista Eagle is ideal for live and rehearsal environments, simply plug-in and play. The Vista Eagle features a grand concert cutaway body which provides a comfortable playing experience and delivers great clarity and balance for its smaller size. Its comfortable shape makes it ideal for the studio as well as stage performance, and will fit cleanly into a live mix with other instruments. The Vista Eagle is better-suited to fingerpicking techniques, however it can accommodate medium-strength picking just as well. The Vista Eagle's body also features a Venetian cutaway design, which is renowned for its sleek, smooth lines that offer easy access to upper frets, providing full freedom of the fingerboard for more technical styles of play.